Aunt Jackie's Curls And Coils Oh So Clean Moisturizing & Softening Shampoo contains a secret blend of natural conditioning treatments, like olive oil and shea butter, to help soften hair, control frizz, reduce shrinkage, untangle knots and balance moisture. 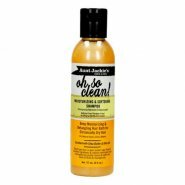 I have 3a hair and this really does help to keep it clean but is super light. it doesnt weigh down my hair at all. This product is very good. When i first used it i expected my hair to i be very dry and brittle because thats what most shampoos does to my hair, but after using aunty jackies oh so clean moisturizing shampoo my hair was left feeling soft clean and detangled. This shampoo cleansed my hair t without stripping it from any natural oils. This is a good product. It leaves my hair feeling nourished and completely moisturised. After one wash my hair feels silky soft. I would definitely recommend this product if you have curly hair. I have 4C hair and I must say that this product is amazing. Wash day are no longer a hassle as this shampoo adds a lot of moisture to my hair and tangle-free. The name of the product really does it justice as it does leave your cleansed and rid of any product build up. I generally have to wash my hair twice but when using the oh so clean shampoo i wash my hair once only. A bottle does last me a while since i don't have to use to much product- a little goes a long way, its great for my natural hair. I would absolutely recommend it. 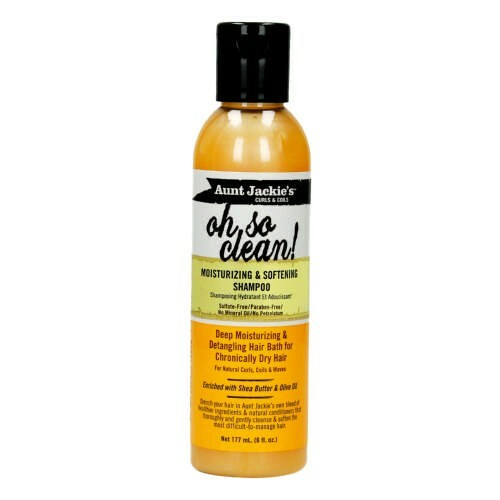 this product worked well for my 4c natural hair, i love having to wash hair and feel that all product built-up is gone. i definitely give it a yes, a little goes a long way with it. I was not sure if the results of this product would be as great as everyone says it is, but after trying it myself, I can safely say that this is one of the best products I've used since I've decided to go natural. Its nourishing to the hair and deep cleanses my hair like no other! I recommend this Shampoo to anyone who has unruly, curly or coily hair! This is a product which is actually true to it's word. It effectively moisturize's the hair leaving your hair feeling really soft and manageable. It is a paraben & sulphate free product which is an added BONUS!!! This shampoo has a silky texture it feels like pure silk in your hands but it lathers up really well which I guess is what makes it cost effective too as you don't need to use half the bottle just to get a good lather. It smells great, it feels great on the scalp and it cleanses well without drying out your hair. It is a wonderful shampoo for natural hair which tangles a lot because of how well it softens the hair. Affordable and effective is how I can describe this shampoo and those are some of the reasons why I always repurchase this shampoo. It's also free from parabens, harsh sulphates, mineral oil and petrolatum, so YAY!! After two washes, it leaves my hair super clean and smelling really good. The shampoo has that signature Aunt Jackie's playful and pleasant scent. A little goes a long way so be careful not to overuse it. With frequent use, I can say that it does contribute to my hair's moisture.